Good Morning, we are enjoying being outdoors with the cooler weather that we are having. We are so blessed and are a good distance from the Wild Fires that are going on here in Texas. Our thoughts and prayers are going out to all our fellow Texans who have lost their homes in the Wild Fires. Thanks to all of you who have inquired about our well being, we have the greatest blogger friends ever!! Lets just sit down and have a nice coffee break while we take a look at this menu. Watermelon Salad With Lime and Minty Dressing at Yum! Yum! Yum! I sure am glad that you stopped by to enjoy the morning with us and sure hope that you have a wonderful week. 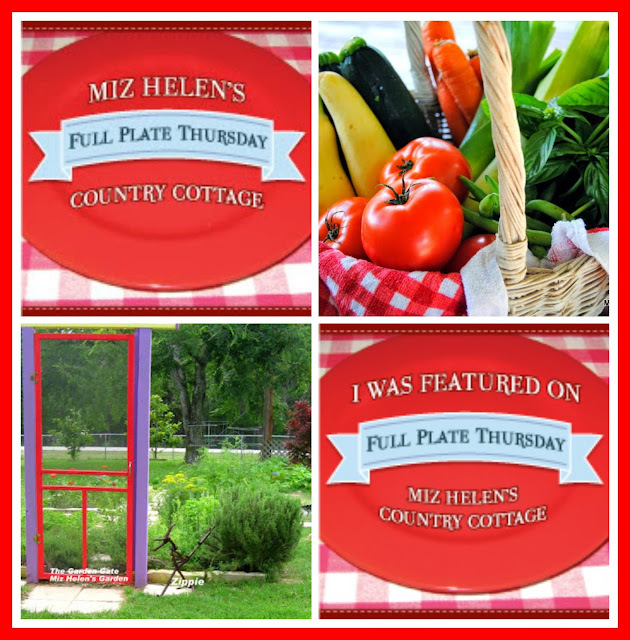 I will look for you at Full Plate Thursday and hope you are getting those Chili recipes ready for The Texas Star Chili Cook Off starting October 1 through October 31, 2011. 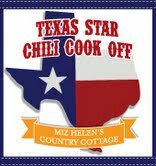 Get all the details right hereTexas Star Chili Cook-Off you can pick up your badge code on the side bar. Looks like a good week at your home. I have yet to write out our menu but it always keeps changing anyway. Take care. Miz Helen! 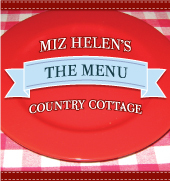 I think your menus are fabulous! Each week I get great ideas and inspiration from you! Your sopapillas are must try's! Thanks for joining ON THE MENU MONDAY with your wonderful dishes! I'm so glad that you all are ok. I'm praying for rain over Texas and that the wildfires will stop. I'm with Yvonne, those Sopapillas are a definite must try. Glad to hear you are safe from those wild fires. Have a great week! Hi Miz Helen. Just popping in to say hi and let you know that I may not have time to link up with "Full Plate Thursday" this week as I'm travelling interstate for a couple days. It's been a busy lead up to it and we leave late Thursday evening. Just wanted to let you know I made your "Country Ribs" rub and sauce recipe and I was in heaven! I'm even salivating thinking about it. I just loved it and I think you're on a winner with that one. You should bottle it and sell it. I also wanted to ask your permission to post your recipe on my blog. I cooked chicken legs with the rub and the sauce. Let me know if there's a problem and I won't post. Thank you so much for a lovely, lovely recipe. It's going to be used all summer long at our house!